"How about we open a lesbian bar? There's a lot of lesbians these days, you know. Sometimes I think half the women I know are lesbians. I used to think my mother was a lesbian. I know my wife is." I've often thought that the hardest films to make must undoubtedly be the ones that deal with the realities of everyday life. Sure, it might be work making a multi-million dollar blockbuster where you have to make buildings explode or aliens conquer Earth, but what happens when you have no laser beams or interstellar critters to create fantasy? 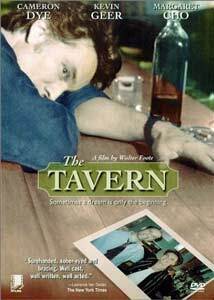 The Tavern is such a film, as it unflinchingly portrays the mundane (and not so mundane) world of ordinary people. There's no special effects, no complex or arty photography, and no brand-name stars hoping to shake off typecasting by doing a "serious drama." Director Walter Foote has picked up this gauntlet and accepted the challenge, crafting what is certainly amongst the best of recent independent cinema. Ronnie and Dave are two, fairly average guys. Dave is a family man with two kids, and Ronnie is a bartender trying to shake off a past of alcoholism. Together, they dream of opening their own, high-quality bar and grill. As the story opens, they've managed to put together enough money to seriously consider buying their own place, in a location where another bar is about to close down. After a lot of begging and deal-making, they're able to cough up the lofty $60,000 to get started, and so they open "The Tavern on Main." What follows is the story of how, through ups and downs, the two have to deal with success, failure, and the people who helped them get there. Dave must deal with an unsupportive wife that cannot see any merit in his dreams (it is not hard to blame her) and Ronnie must deal with the fact that, in a way, he's become a surrogate father for the child of his late brother. Of course, the money problems become huge factors in their lives as well, and the constant headaches of finance and business popularity overshadow their happier moments. At no time does director Walter Foote let thing get too fantastic or out of hand. This is a story about typical small-business owners, and it stays that way. None of the sub-stories (the family and romance aspects) overtake the core of the film, which is the day-to-day operations of the tavern. It sounds like it might be boring or uninteresting, but things are handled really well, immersing these likable fellows in problems that you want to see them overcome. All of the actors do a superb job of performing their roles; it was especially nice to see Kevin Geer in a balanced role, as he usually seems to play psychos and killers. Comedian Margaret Cho has a brief role as Dave's wife, but by no means is it intended as awkward comic relief; she actually turns in a good supporting performance. On the same topic, comedy in the film is handled very smartly, and is injected in ways that work rather than just cheap laughs. While the story is not entirely a happy one, the strict adherence to keep things very much rooted in reality still makes it very entertaining and impressive. The depressing aspects do not drown moments in darkness, but rather feel very much like unfortunate, bad luck that we all experience on occasion. The two men have gotten into a situation that is way over their heads, but sadly, that seems to be a mistake many people make in their lives. No judgments are made, and there are really no moral or message here. Instead, for an hour-and-a-half, we're simply placed into someone else's shoes. Image Transfer Review: Although not anamorphic, the 1.85:1 image is very satisfying. As the film uses a very dark but colorful palette, the perfect black level and overall sharpness insure accurate representations of these colors. The print is a bit damaged, with speckles and scratches, but it's nothing serious. Some scenes show signs of slight fading (perhaps done on purpose) and background shimmer pops up here and there, but it's a very pleasing, solid image. Audio Transfer Review: The Dolby 5.1 mix and the Dolby 2.0 stereo mix are really not that different. Dialogue and sound effects are center channel-oriented for the most part, but the musical score is more expansive. In the 2.0 mix, the musical score is stereo, and in the 5.1 it is expanded into a very auditorium-like quality, using the surround channels as well. It's a satisfying mix, but nothing massive. Extras Review: The disc features a trailer, filmographies, and weblinks as its suppliments. The weblinks are listed as text, as well, so even without a DVD-ROM drive, you can access the official website for The Tavern, as well complete production credits. The presentation is generally satisfying, but the film defaults to to the 2.0 audio track. While not a 2-disc, special edition with extra sauce, the merits of this strong, dramatic outing speak for themselves, marking an impressive entry into cinema by Walter Foote, who debuts as writer, director, and producer. The abrupt ending leaves some questions open, but this was obviously intentional, and provokes the viewer into thinking about these people long after the film is over with. Highly recommended.